This morning, I told Jesus that I really needed some encouragement for the day...especially to get my focus off of all the pain right now. I was reading thru Jeremiah and came to this verse: "...Behold, like the clay in the Potter's hand, so are YOU in my hand." ~Jeremiah 18:6 I am SOOOOOO grateful to know that I am in HIS hands...which are so very loving and competent. <3 HE is fighting for me! HE is EVERYTHING I need. HIS strength is made perfect in my weakness.....<3 Because, it's not ME...it's not MY strength....totally feel like I have nothing left right now....nothing left to keep fighting...and yet, as soon as I get my eyes OFF of me, and ONTO HIM, focusing on HIS promises, claiming HIS Word, PRAYING BACK His Word to Him, focusing on TRUTH, focusing on the BEAUTIFUL fact that He has already WON this battle for me...that this burden is NOT mine to carry...it's HIS...it's then that my spirit can soar! Even if my physical body cannot. It is then...that His presence is so real and so dear and so sweet. HIS arms hug me when I need that gentle reassurance of His love, HIS strength carries me when I'm too weak to walk, HIS intercession continually intercedes for me when I don't know what to pray anymore, and His precious hands...His nail-scarred hands wipe the tears from my eyes. <3 The realness of Jesus never ceases to amaze me...the realness of HIS love in the lives of those around me and in my own life is so precious. SO precious. I can't wait to behold Him someday in Heaven....but until then, may my life be a testimony to His REDEEMING love, grace, power and strength. "Only a sinner saved by grace!" "Heaven came down and glory filled my soul, when at the CROSS the Savior made me WHOLE; my sins were washed away (PRAISE GOD), and my NIGHT was turned to DAY, Heaven came down and glory filled my soul." "Now I've a HOPE that will surely endure...after the passing of time...Shadows dispelling, with JOY I am telling, He made all the darkness depart!" Oh, Precious Friend! <3 Whatever you're fighting today...keep your chin up, your eyes on His throne, your heart in His Word and your lips breathing prayers to Heaven! God is on your side!!! "...Behold, like the clay in the Potter's hand, so are YOU in My hand." ~Jeremiah 18:6 REST in knowing that YOU are in HIS very competent and loving hands tonight. 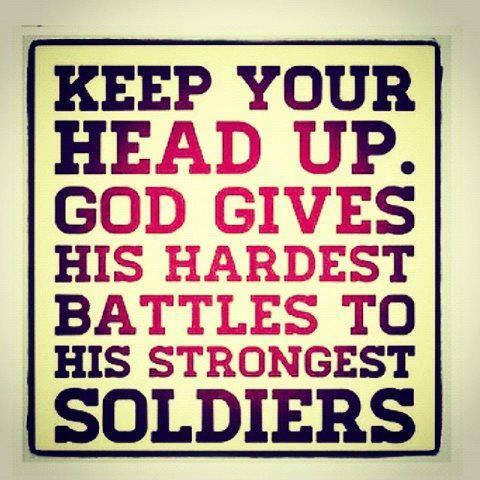 ♥ He's got you and He's got the battle you are fighting. ♥ IN HIM the battle is *already* WON! Praise the Lord!